more common versions. Alleluia, Alleluia, Alleluia. Alleluia, Alleluia, Alleluia. O filii et filiae,Rex caelestis, Rex gloriae, morte surrexit hodie. R. Alleluia Ye sons and daughters of the Lord, the King of glory, King adored,this day Himself from death restored. R. Alleluia, Ex mane prima Sabbati ad ostium monumenti accesserunt discipuli. R. Alleluia All in the early morning gray went holy women on their way, to see the tomb where Jesus lay. R. Alleluia Of spices pure a precious store in their pure hands these women bore, to anoint the sacred Body o'er. R. Alleluia In albis sedens angelus praedixit mulieribus: In Galilaea est Dominus. R. Alleluia The straightaway one in white they see, who saith, "seek the Lord: but He is risen and gone to Galilee." R. Alleluia Et Ioannes apostolus cucurrit Petro citius, monumento venit prius. R. Alleluia This told they Peter, told John; who forthwith to the tomb are gone, but Peter is by John outrun. R. Alleluia Discipulis astantibus, in medio stetit Christus, dicens: Pax vobis omnibus. R. Alleluia That self-same night, while out of fear the doors where shut, their Lord most dear to His Apostles did appear. R. Alleluia Ut intellexit Didymus quia surrexerat Iesus, remansit fere dubius. R. Alleluia But Thomas, when of this he heard, was doubtful of his brethren's word; wherefore again there comes the Lord. R. Alleluia Vide Thoma, vide latus, vide pedes, vide manus, noli esse incredulus. R. Alleluia "Thomas, behold my side," saith He; "My hands, My feet, My body see, and doubt not, but believe in Me." R. Alleluia Quando Thomas vidit Christum, pedes, manus, latus suum, dixit: Tu es Deus meus. R. Alleluia When Thomas saw that wounded side, the truth no longer he denied; "Thou art my Lord and God!" he cried. R. Alleluia Beati qui non viderunt et firmiter crediderunt; vitam aeternam habebunt. R. Alleluia Oh, blest are they who have not seen their Lord and yet believe in Him! eternal life awaitheth them. R. Alleluia In hoc festo sanctissimo sit laus et iubilatio: benedicamus Domino. R. Alleluia Ex quibus nos humillimas devotas atque debitas Deo dicamus gratias. R. Alleluia Whose mercy ever runneth o'er; Whom men and Angel hosts adore; to Him be glory evermore. R. Alleluia 3. Regina Caeli, Chant O Queen of heaven, rejoice, alleluia, Because the Son you were chosen to bear, alleluia, Has risen as he foretold, alleluia! Pray for us, oh, pray to God, alleluia! Latin: Regina coeli, laetare, alleluia Quia quem meruisti portare, alleluia Resurrexit sicut dixit, alleluia Ora pro nobis Deum, alleluia. 4. "Allelujah, Sing to Jesus"
in the Eucharistic feast! 5. "Allelujah, Allelujah, Give Thanks"
Jesus is Lord of all the earth He is the King of creation Ref. 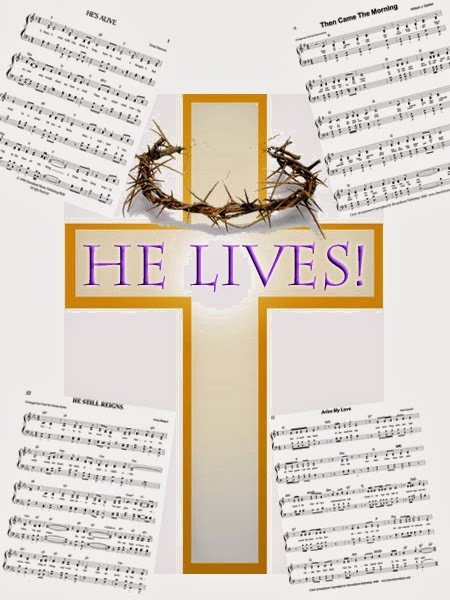 Spread the good news o'er all the earth Jesus has died and has risen Ref. We have been crucified with Christ Now we shall live forever Ref. 6. "Jesus Christ is Risen Today"
Father, Son, and Holy Ghost. Alleluia! 7. "At the Lamb's High Feast We Sing"
By: office hymn, 17th cent. "The Strife is O'er, the Battle Done"
Translated by Francis Pott, 1832-19091. Alleluia! Alleluia! Alleluia! Alleluia! 9. "That Eastertide with Joy was Bright"
Words: Un­known au­thor, 5th Cen­tu­ry (Au­ro­ra lu­cis ru­ti­lat); trans­lated from La­tin to Eng­lish in Hymns An­cient and Mo­dern, 1861, based on John M. Neale’s text. The Hallelujah Chorus is part of the oratorio Messiah by Handel, concluding the second of three parts. The text of the chorus are taken from the King James Bible. In many parts of the world it is traditional for the audience to stand during the Hallelujah Chorus. Legend has it that King George II was so moved by the music that he stood to his feet when he heard it, requiring that his subjects followed suit.